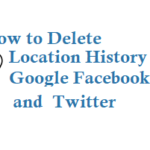 By enabling 2 Step Verification on your personal email accounts and social media account you will be safe from hackers or from bad people who want to steal your personal information or delete all of your emails, contacts, photos, etc. and even the hackers can blackmail for money. 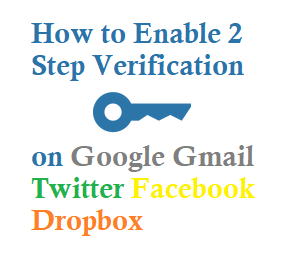 See below article to Enable 2 Step Verification on Google Gmail Facebook Twitter and Dropbox accounts. 1. Login to your Gmail account and on the upper right corner click on My Account Button or (https://myaccount.google.com/). 2. It will display Your Account Details Page, Now click on Signing in to Google under Sign-in & security Tab. 3. Now search for 2-Step Verification Tab, it will display a new page. 4. It will ask you to login, after this Enter Your Mobile Phone Number then give the received Code and Click on Turn On Button. Check below Video for more Information. 2. From Top Right on Your Profile Icon Search for Settings or go to https://twitter.com/settings/account. 3. Now click on Security and privacy Tab, Search for Login verification then Check the Box and Enter Mobile Number. 4. Enter the received code and now you have activated 2 Step Verification on Twitter. 3. 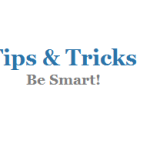 Search for Use two-factor authentication on the same page, use your mobile number and Turn on Two-factor authentication.  You can also enable Security Keys, Code Generator, Recovery Codes, App Passwords ·and Authorized Logins for extra layer security. 3. Turn on the Button and update your mobile phone number. Two-step verification adds an extra layer of protection to your account.